I am on a listing from C&T Publishing and from Martingale that I get ebook copies of new books that come out. I have the opportunity to review them. It’s really fun and I enjoy seeing the new books that come out. Every once in awhile I find a book that I think I would really love and I request a hard copy of the book. 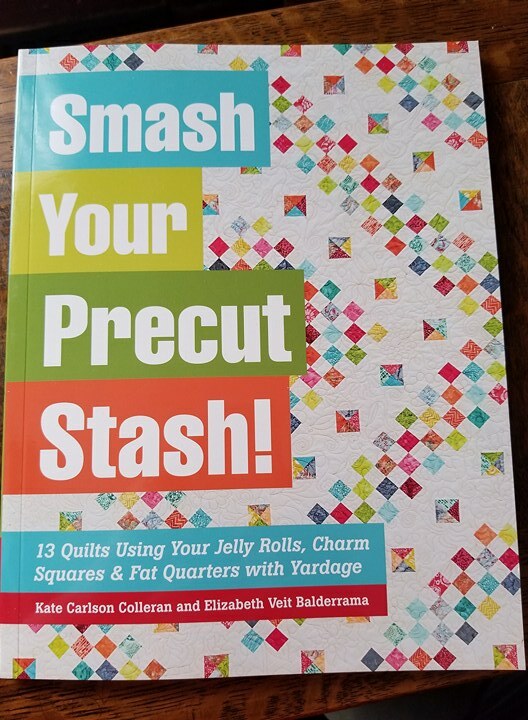 I recently got an awesome book from C&T Publishing, Smash Your Precut Stash by Kate Carlson Colleran and Elizabeth Veit Balderrama. This book immediately caught my eye just from looking at the quilt on the cover. I also thought the title was pretty good too. I know there are many of us out there hoarding a few precuts. I’ve gotten better and have gifted a few away to beginning quilters..but honestly, I know fabric doesn’t have an experation date but (coming from my Walt Disney Toy Story mind) if I were a precut I would much rather be together in a quilt than sitting on a shelf and not let out to play!! As I was paging through the book I couldn’t help but think of my blog reader Nell. She is on some crazy mission to get 16 (don’t remember the exact number) quilts made by May. Her son is graduating from highschool and she wants to gift quilts to her son’s friends. Oh my girlfriend!! First up the cover quilt!! I love it. This is would be a real “safe” quilt to make as it doesn’t scream traditional or modern. I think any teen would love this. I know I do. I love most quilts that are in a barn raising layout. I liked this one too but not for Nell’s project. Too much piecing….but it sure is pretty. I could easily see this as a beautiful bed quilt in the spring time. So pretty. This was the quilt I was sure Nell could make. Easy 4-patch sewing. Knowing Nell she likely already has a stash of 4-patches sewn. What a perfect guy quilt…don’t you think? The next quilt I liked too….sometimes, simplicity is a draw for me!! That looks to be easy piecing too!! Something fun about the book is that there is an extended section after the patterns. In this section the authors give some tips on how to make the quilts bigger. Remember that pretty tulip quilt that I showed you in this post….well here is how they suggest quilters could enlarge it. I love this section. I can see how it would be so helpful. Here’s the proposed enlarging for “Wayne’s Quilt”. I also like that these quilts are sewn up in a different color way. I thought this quilt was great for a guy…Look, now I think it’s a great girl quilt. After the chapter on enlarging the quilts the authors added a photo gallery of the quilts in different color ways. I loved that too! For those wondering…you really don’t need precuts for this. Of course it might be more handy but if you’re like me and have a tote of 2 1/2″ scraps, use them…they would be perfect! All in all, I really liked the book. I can see for anyone gifting quilts or needing quick quilts could really make use of this book. The book is for sale via C&T Publishing or Amazon. Also if you want to see pictures for a few more of the quilts, you can see them by following this link. I have my eye on making the Wayne’s Quilt. I think I have some 4-patches already sewn….Hmmm. I’m off to dig. I do think I’m going to send this book on to Nell. She needs some encouragement if she is going to get all of those quilts made….so Nell, send me your address!! This entry was posted in Quilt Book Reviews on February 17, 2018 by Jo. Jo, you are the most thoughtful and amazing person! Im sure Nell will feel the same way! I like this book also, and will be ordering one soon! It looks like a great book to have on hand for all those precuts we buy and then wonder what to do with them. I like that they show the quilts in more than one colorway, clever idea. I’m sure Nell is going to love the book and I hope she gets those quilts all made in time. Thanks for sharing with us and for passing it along to Nell. Go Nell! Wayne’s Quilt would look great in a red/white/blue colorway, too. Perfect for a Quilt of Valor. I’m always on the lookout for good ‘guy’ quilts for those. Whoot! WHOOT! 702 N. Cherry St. Valentine, NE 69201 So excited- 2 DONE 5 ready to quilt and 5 more in the cut to piecing started categories. . .